This balcony overlooks both Mondrian’s pool and Biscayne Bay. This table has an obstructed view of the pool. This table is located at the Sunset Lounge Terrace. Exclusive tables outdoors with a prime view of Biscayne Bay and the promenade. Table administration fee is a mandatory charge that is NOT included in the package price. Take in fireworks on the outdoor patio of the Mondrian Ballroom. Each Seated VIP ticket holder shall have a reserved seat for the entire event. Enjoy a poolside view, the ultimate way to party in Miami. Each Seated VIP ticket holder shall have a reserved seat for the entire event. A table accompanying the reserved seat is not guaranteed. Exclusive indoor seating in a private ballroom adjacent to the pool. Views of Biscayne Bay and the promenade in a cabana with luxurious seating. The ultimate NYE experience: a comfortable area for 15 of your closest friends on a massive poolside chaise with your choice of liquor and poured champagne. The ultimate NYE experience: a massive poolside chaise that seats 15 with your choice of liquor and poured champagne. The following are acceptable forms of identification: U.S. Driver’s License or ID card; U.S. Military ID; U.S. Passport; Canadian Driver's License. For international visitors, we require a government-issued Passport. Unfortunately no other form of international identification is valid. 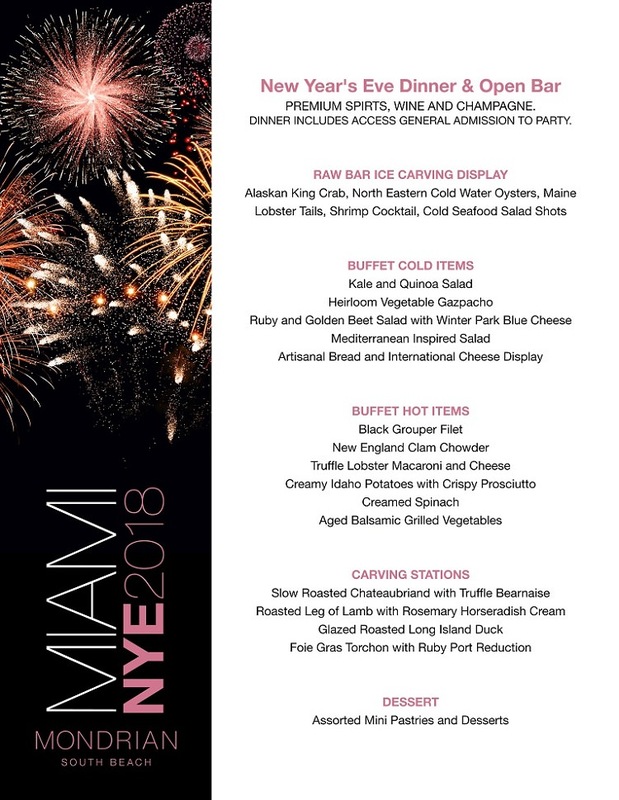 Launch into the year full throttle with South Beach’s renowned extravagance at Mondrian South Beach’s New Year’s Eve party. Situated on the spectacular waterfront of Biscayne Bay, the sultry Mondrian South Beach is amping up for an intoxicating bash that cannot be missed. There’s no shortage of luxuries at this event that only happens once a year.The Mondrian’s beach-side atmosphere will be flooded with amenities this NYE. Enjoy a four hour premium open bar in style and celebrate with festive NYE party favors, compliments of the Mondrian. Dance in this sleek tropical oasis to a live DJ playing electrifying mashups and sets of Top 40, hip hop, and house hits. At the Mondrian, Miami’s best will mix and mingle as the moon sets on a breathtaking view of Biscayne Bay. An epic fireworks show will ignite the party even more as you ring in the New Year with an exhilarating live countdown and complimentary champagne toast. With a host of exclusive VIP options that deliver amenities like reserved seating and bottle service, Mondrian South Beath’s bash cannot be outdone. This upscale hotel and glimmering nightlife hotspot offers world-class amenities that will rival your most daring NYE party fantasies. Visionary Dutch designer Marcel Wanders’ whimsical contemporary design for the hotel lounge is an homage to “Sleeping Beauty’s castle” with a fantastical, pristine aesthetic that will make your New Year’s feel like a fairytale come true. In the soaring lobby, floor-to-ceiling windows frame stunning waterfront views while the floating staircase – an architectural masterpiece – dazzles the eye. Combined with the intoxicating energy of Miami Beach, the intensity of Mondrian parties cannot be ignored. This legendary bash has eight different areas of VIP access. With a stunning view of Biscayne Bay, the Water Club VIP tables are the closest to the beach. People-watch on the promenade and as midnight arrives, take in the NYE fireworks as they erupt over the water. Poolside VIPs enjoy a prime poolside location, the ultimate way to party in Miami. Want the best of both worlds? The Elite Balcony VIP area overlooks both Mondrian’s pool and Biscayne Bay. For those who prefer to take in the evening within the comfort of a luxurious space, there are Ballroom VIP tickets. This exclusive indoor reserved area was designed by Marcel Wanders – the visionary who’s worked with Baccarat, Swarovski, and Louis Vuitton. If you want the exclusivity of the Wanders’ Ballroom, but prefer to be outside, pick up a Ballroom Patio ticket to take in fireworks on the outdoor patio of the Mondrian Ballroom. With best view in the house of Biscayne Bay, the Skyline Cabanas feature plush seating and all of the amenities. If you’re coming with a cohort and looking to go all out, the ultimate NYE experience is the Baller Daybed. This massive poolside chaise is for fifteen members of your crew to comfortably relax with your choice of bottomless liquor and poured champagne.A dinner ticket option offer access to a decadent buffet with Maine lobster tails, a carving station, and more.No matter what way you choose to celebrate, the Mondrian South Beach Hotel will deliver the most decadent New Year’s Eve you’ve ever experienced. For the company of a kinetic crowd and a mesmerizing backdrop, there isn’t a destination that can top this one. Tickets are on sale now for a high-voltage New Year’s Eve compliments of South Beach’s most enchanting location – Mondrian South Beach. Seated VIP: reserved seating for your group, with no bottles. Ultra VIP: Table service with bottles. The number of bottles depends on your group size. Platinum VIP: This provides the same amenities as the Ultra VIP, but with more bottles. 2.) TABLE PACKAGE FOR TWO: A table package for two entitles you and one other person to a table with a bottle of champagne. 3.) TABLE MINIMUM: This allows your group to purchase bottles and/or drinks off the bottle menu up to the amount to which you have purchased. For example, those who purchase a $2000 table minimum ticket will have $2000 dollars worth of credit to spend at the table. Your admission tickets are also included for the area which you selected.